Back in the day when everyone ran around in Kingswoods, Valiants and Falcons (being Holden, Chrysler and Ford) and you didn’t have to worry about fitting special tow hitches because the vehicles still had leaf-spring suspension, family caravans were very common. Indeed, the likes of Millard and Viscount turned them out in the thousands. They were, of course, a little more basic than the vans we know today. 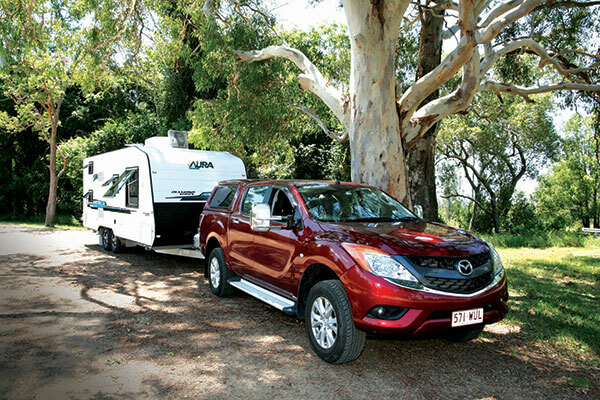 Times have changed on all fronts and whilst family caravans are still around, they frequently appear in multiple forms—camper trailers, pop-tops, pop-outs and other variants. 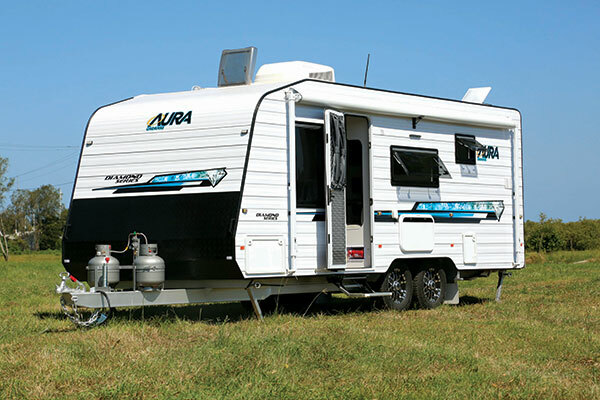 Often budget is the driving factor but some family caravans are quite expensive. Which is why something like an Aura Diamond tandem-axle van with a price tag just under $60,000 might well create some interest. Obviously, it’s a point of note because that was almost the first thing that the Kratzmann Caravans team at Burpengary, Qld, mentioned to me before I hitched up. So what do you get in a full caravan that is designed for family use? In this case a conventional constructional. Underpinning the Diamond bodywork is a box section DuraGal chassis with 150x50mm (6in x 2in) main rails and drawbar, along with a 50x50mm (2in x 2in) raiser above the tandem-axle suspension. A very solid structure indeed, almost offroad with so much steel work, but the load sharing leaf-springs definitely indicate on-road travel is the aim. To keep the balance, the two 80L waters tanks are mounted above and just behind the wheel axles. Underneath the aluminium cladding, a Meranti timber frame keeps everything in place. 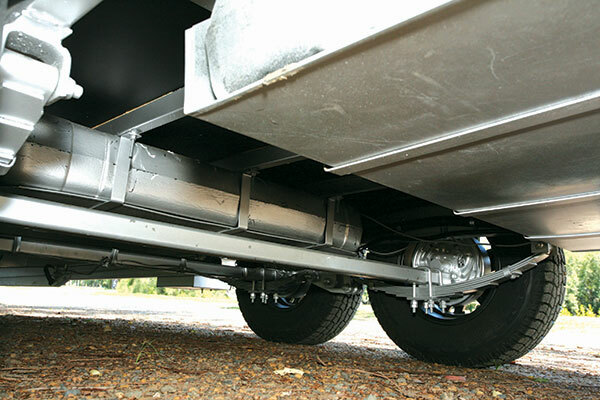 With the two 9kg gas cylinders mounted on the drawbar and the battery box forward of the offside wheels, there’s plenty of room in the front tunnel boot for the camping essentials. With family vans, tow vehicles are always a consideration. With an ATM of 2625kg, the Aura Diamond really is out of the “Prado” range, given the Tare Mass of 2125kg, unless really lightweight travel is planned. However, it will fit very comfortably behind any of the current generation of dual-cab utes with towing capacity to spare. Something certainly to keep in mind. 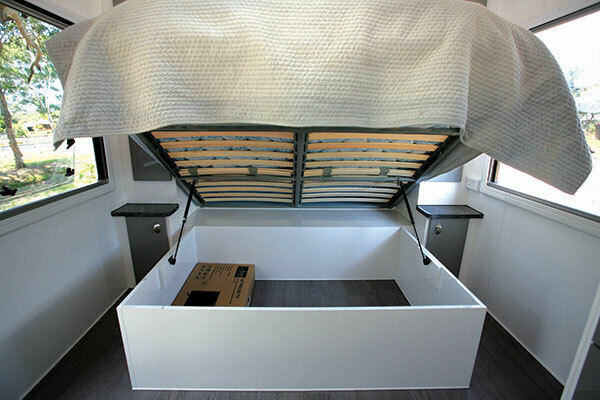 Bunk beds form an integral part of any family caravan layout and these two are fitted into the rear area of the van, along the offside wall, facing a full bathroom on the opposite side. Mum and dad’s island bed sits at the front of the van, leaving space along the offside wall for a kitchen bench and a dinette between the habitation door and the rear bathroom. Black, white and several shades of glossy grey form the interior colour scheme, which is quite easy on the eye and does a reasonable job in the space perception department. Starting in the rear, both bunk beds measure 1.8m x 0.7m (5ft 11in x 2ft 4in) and they both come with a window each and a reading light. The ladder is the industry standard item of a ply sheet with cut out holes—a space saver but not necessarily great on bare feet. 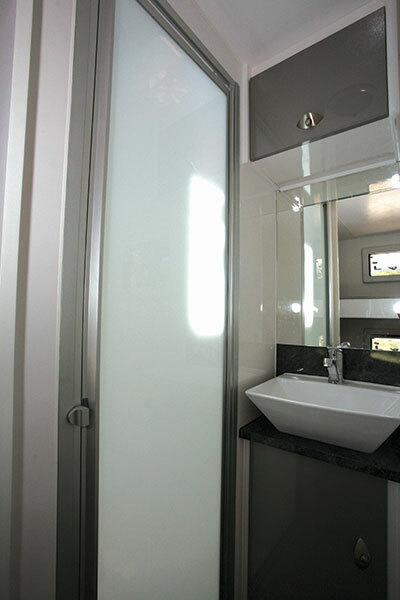 Across the way, the bathroom isn’t quite as long as those fitted more conventionally along the rear wall but there is still space for a separate shower cubicle, Thetford cassette toilet and a small vanity cabinet complete with a pedestal-style washbasin. Between the bunks and bathroom, the wardrobe cabinet contains both a shelf fitted cupboard above and a top loading washing machine below. That last item would have been considered quite unusual in a family caravan built say five years ago, so an interesting sign of the times. 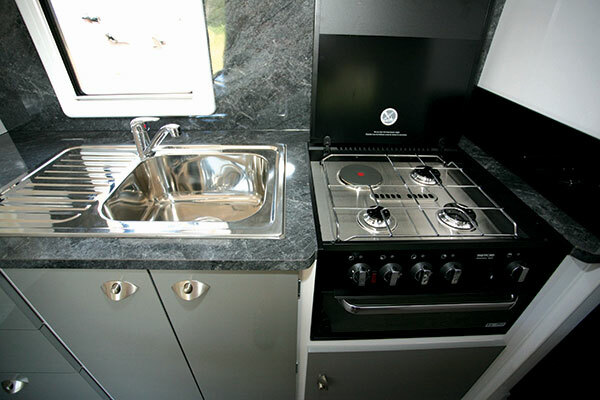 For a family caravan, a larger-than-usual kitchen area is definitely going to benefit the chief cook. This one scores quite well with a reasonable amount of bench working space and storage space with three good sized drawers, two cupboards and two overhead lockers. The latter are quite deep and would benefit from an extra shelf. There is a third locker but that’s used for the battery management system, along with items like the water heater and water pump switches. 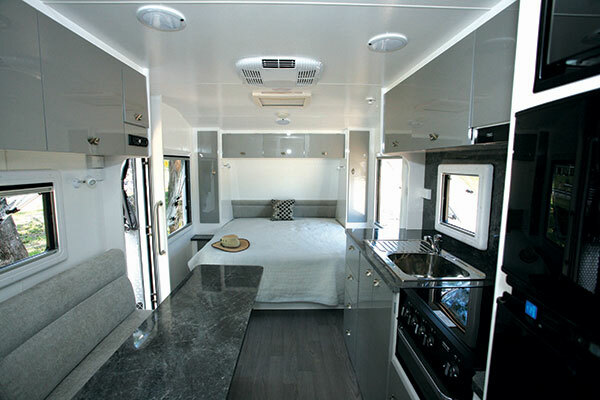 There are, of course, the usual essentials—four-burner cooktop and grill, stainless steel sink and Thetford 177L fridge with microwave above. 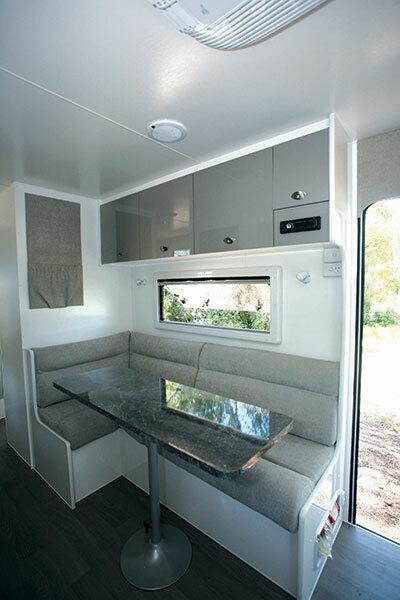 For a family of four, the L-shaped dinette will need an extra folding chair or two, especially as the table is not exactly large—it could almost do with an hinged extension. Below the cushions most of the under seat area is taken by the wheel arch and although the end section offers a bit of space, the seat cushion has to be raised. Above, there are three overhead lockers which like the kitchen ones are quite deep and could do with a shelf or two. A single power-point and the light switches are tucked into the corner by the entry door. 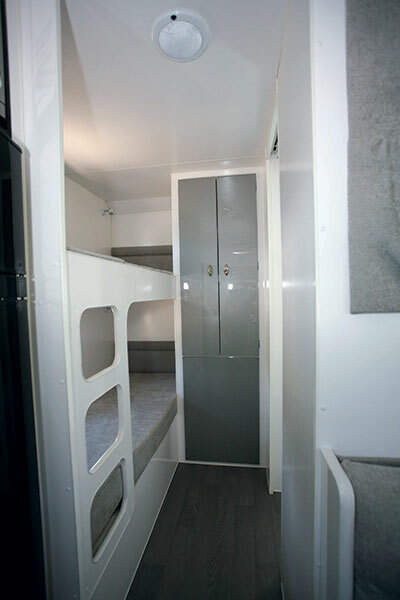 Up front, the 1.88x1.52m (6ft 2in x 5ft) bed has the expected bedhead of side wardrobes, overhead locker and bedside cabinets along with large windows on either side. There aren’t too many extras apart from that but you do get all the essentials. 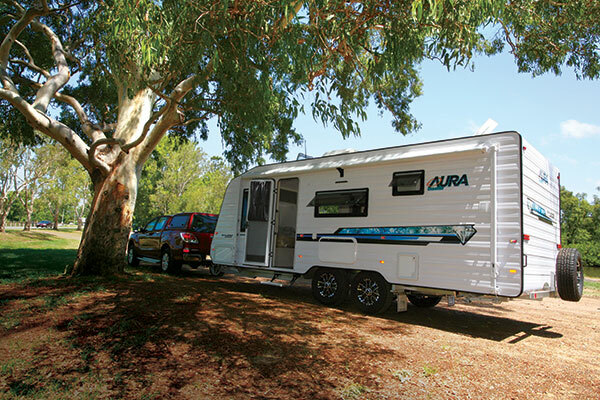 Aura’s Diamond caravan certainly has most of the essentials for family caravanning, including bunk beds and an awning for all those alfresco activities. It’s sharply priced and doesn’t require an oversize tow vehicle which is great for anyone on a budget.